I had to cope with some health problems because I had a bad cough. So it was not so bad for me that everything went like that. And then, of course, we tried every day to keep the trail to Camp 1 open. 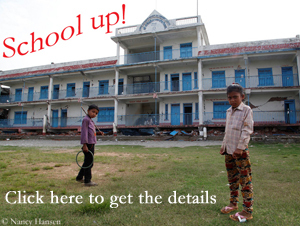 But in fact your physical condition doesn’t get better if you only sit in Base Camp doing nothing. Your body is getting more ponderous. On the days without any chance to go out, I always have the opportunity to write my book, to film, just enjoy the sun or talk to all the men here about women. On winter expeditions, patience is even more in demand than during expeditions in the other seasons. Is it hard for you to wait? I must honestly say: yes. But it’s so important for me to reach this summit in winter that I actually take three months to achieve my aim and don’t put myself under any pressure. I am here to stand on top of Nanga Parbat. I’ll try anything, and I know that Simone Moro is the best climbing partner I can have. In this last period, I’ve already learned a lot from him, particularly concerning winter climbing. We get along very well, and I’m happy to be here and to have this opportunity. You both have given up your plan to ascend on the Messner route. 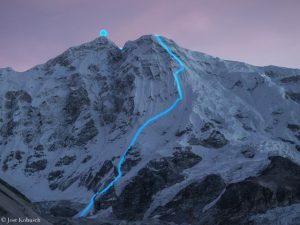 Tomek Mackiewicz and Elisabeth Revol had climbed on this route within striking distance to the summit. What caused you to change your plan? 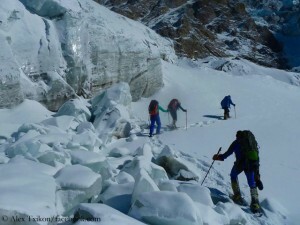 When Tomek and Elisabeth tried to reach the summit, we were along with them in Camp 2. We had to wait there for two days because of the weather, and unfortunately our food ran short. Despite the good weather window, we decided to go down. 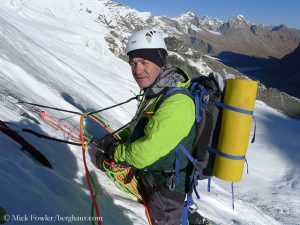 Upon their return from the summit attempt, Tomek and Elisabeth advised us against climbing the route because there was a dangerous serac that could collapse at any moment. What conditions do you expect now on the Kinshofer route? Simone and you joined forces with Alex Txikon and Co. Does that also mean that you’ll do the summit push together? Or will you then try to reach the highest point in separate rope parties? It’s too early to tell. Anyway, we’ll set off together, and we are already looking forward to doing it. We all are on the ball and have a lot of fun together. Three teams have already left the mountain. 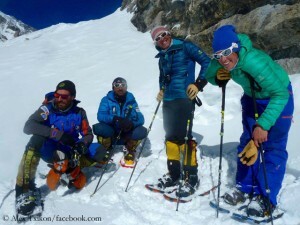 How much time are you willing to spend on Nanga Parbat? 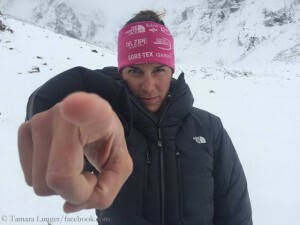 Many commentators in the media – by the way I don’t – talk about a race on Nanga Parbat. What do you think about that? If there was one, then it’s over now! And I am very happy and looking forward to whatever comes. And the media are really taking the easy way. Some of them construe their own reality putting things together, listen to just one opinion or speculate, but don’t know what they are doing here. Many of the disputes, disagreements and differences here in Base Camp arose thanks to and for the media. 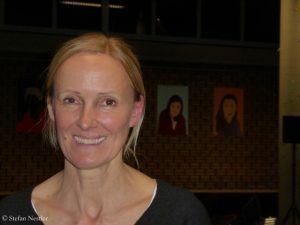 Climbers are reported from outside as being good or evil, behaving right or wrong. And we ourselves who sit here in Base Camp are only astonished, but don’t have any influence of some things that happen. But I must say, it has opened my eyes. This is not the right place for climbers who only come here to please the world outside, to report exciting stories to get as many likes, clicks or God knows what else. Among other things, we have to struggle to survive. In the icy cold, a stupid mistake may lead to death. And your comrades will hardly be able to help. Everything we do here has its value. But we too have a certain value which sometimes seems really fragile. How do you deal with the disagreements between Alex and Daniele, which the Spaniard has made public? I am, or rather, those who are still here are suffering from these disagreements. A particular person has played a dirty game and now has to live with the consequences. Is it for you a special situation as the only woman among men on the Diamir side? I have Igone (Mariezkurrena), the girlfriend of Alex, as my support here. Sometimes it is quite pleasant to be only among women. With the men you can only talk about the same two themes: women and what’s hanging between men’s legs. 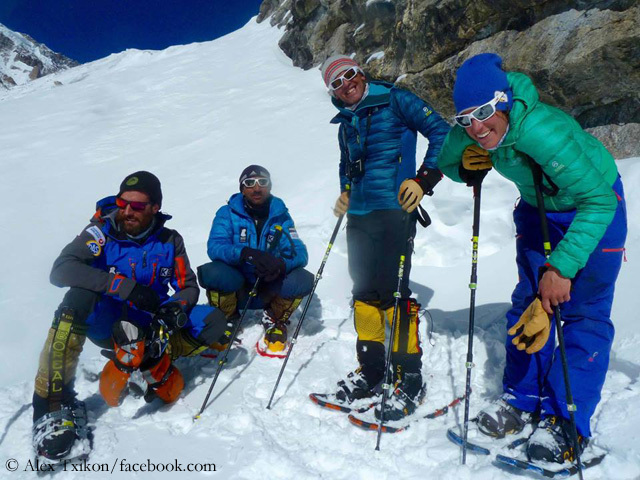 Update 8 February: Italian Daniele Nardi abandoned his expedition and left Nanga Parbat Base Camp. He is anything but a self-promoter. Paul Ramsden does not belong to the group of extreme climbers who are out to market themselves and want to be constantly in the spotlight. Though he certainly deserves it – the list of his first ascents in the Himalayas is long.